An employee advocacy program has many benefits for your organization as a whole and for the employees who make it up. There are some challenges that come with starting and maintaining a program that prevents everyone from doing it. Employee advocacy is enabling people in your organization to easily get involved in your brand’s initiatives. Some of the biggest challenges for a successful program include targeting and recruiting employees, getting buy-in from them, and keeping them interested in the program for the foreseeable future. Casey Hall, president and founder of Lumberjack Social, hosted a webinar where he discussed how he built and grew an employee advocacy program with over 3,000 users, which resulted in half a million shares and 80,000 clicks. Here are his tips and tricks for a successful employee advocacy program. Employee advocacy programs increase your reach on social media and the authority of each message you send. Reach refers to the number of people who could potentially see a message you share. According to the MSL Group, your employees are connected to 10x more people than your brand, and messages shared by employees reach more than 5-times further when shared by employees than when shared by a brand account. When you share a message through your employees, it’s viewed by people who likely don’t already follow your company account, so you’re reaching new people, Hall said. Furthermore, your employees have influence that your brand just doesn’t. This is where authority comes in. According to the Nielsen Group Trust Authority, 83% of people trust recommendations from friends or family. This is more than people trust brands or paid ads, which should come as no surprise. You likely view a paid ad or a post from a branded account with a level of skepticism, but if it’s a post from someone you know and trust, then it has a chance to resonate with you. This is why when people share a message on social media, they receive far more engagement than brand accounts, Hall said. The benefits of employee advocacy are clear, but there are challenges that prevents everyone from doing it. Employees are not always forthcoming to the idea of signing up for your program. Some employees just don’t want to use their personal social media accounts for business reasons at all, and that’s OK. Not all employees are needed to be successful. According to the Marketing Advisory Network, about 30% of employees say they don’t want to be in a program because they don’t want to overwhelm their network with posts about a company or don’t want to sound like a company robot. You can appease this concern through your content strategy. If you’re only sharing content about your company, then your program won’t be successful anyways. If you share content about your industry, such as common trends and challenges, and other content outside of promotional material, you won’t make people sound automated and branded. A second challenge that often bubbles up is around the curating of the content itself. About 14% of employees say they don’t have time to take part in a program, according to the same survey. Often times, when people say, “I don’t have time,” what they really mean, is “it’s not worth my time,” Hall said. You can change this mindset by promoting the results of your program thus far, and communicating how this program will help the business and the employee. 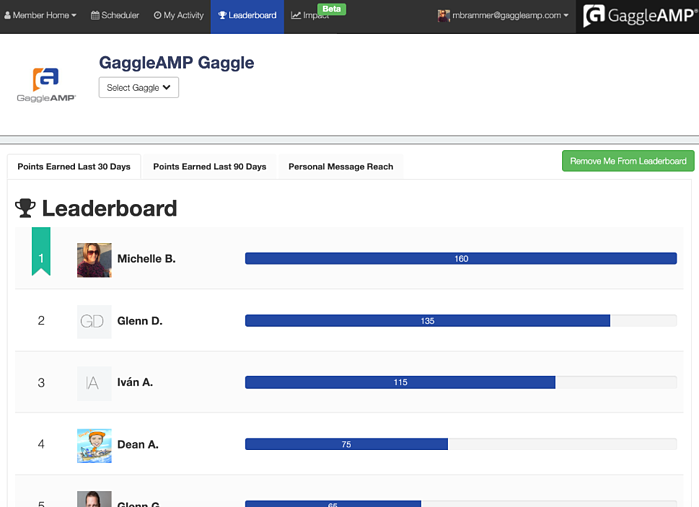 A tool like GaggleAMP allows you to demo to employees how it takes less than five seconds to carry out an action. They’ll get a notification through a tool they’re already using, such as Slack, Chrome, or Salesforce for example, and they can respond to it in just one or two clicks. But what the employee gets out of spending this little amount of time to perform an action is invaluable. By sharing content relevant to their industry, your employees will be viewed as authoritative sources and thought leaders on industry topics. Lastly, people often don’t know what to share, but if they’re in an employee advocacy program, they’ll have a consistent stream of content and messages to share that’s all been approved by their marketing team. If you get past these challenges, you’ll have an advantage over your competition who might not use employee advocacy. To start your employee advocacy program, start with a small group of employees. They will be the proponents of your program to the rest of the company. You may already know who in your company is active on social media and promotes your brand, so start with those people. Also, get buy-in from the leaders and executives in your organization because if they’re active, it will benefit your program. These company ambassadors may be willing to publish an article on LinkedIn or a major publication rather than just sharing and liking posts. This leads to promotion from the employees in the company, and very fast growth for your program, Hall said. Once your leaders and your small group of initial employees start seeing success, this can spread throughout the company quickly. In order to be successful in employee advocacy, you need to do some internal promotion and make it extremely clear how employee advocacy benefits the employee. Communicate to your employees that, although this benefits the company, you are presenting this to them as an opportunity to build their own authority. This gives them more connections to work with and a more respected professional in your industry, Hall said. Often times people in an employee advocacy program gain a better understanding of the organization they work for, and how their individual position contributes to the organization’s overall success. This creates a better sense of self-worth and connection to the company. Another way to draw in employees is through gamification. Gamification works with employee advocacy is by assigning points for each action your marketing team requests of the employees. Whoever gets the most points, or reaches a certain milestone, gets acknowledged and receives an award. This not only draws people into the program but really motivates people to stay active over the long-haul. Some awards you can give out to your best advocates could be company branded backpacks, mugs, shirts and more. Some company’s offer lunch with the CEO, parking spaces, gift cards, extra days of paid time off, or bonus money. You also want to promote the success of the program. Sending out a weekly report that shows the impact of the program lets everyone know how much they're contributing to the organization. To get buy-in from your employees, you want to show your employees what they’re contributing to the company, how it benefits them personally, how it’s easy to use, all while acknowledging them for their efforts. Once you do that, you’ll have a successful employee advocacy program.